As we start to work towards our business and social media goals this New Year, it is important that we are taking the right and smart steps (and not wasting time) in growing our businesses using our chosen social media platform(s). For Instagram has a social media marketing platform, there are some sure-fire ways that will help you increase followers, create more engagement with your followers and turn the same people into customers. When people land on your Instagram account, the first thing they see is your Profile. Make sure you make it one that will be immediately attractive to your target audience and they will want to follow. Use a good photo representing either yourself or your brand. Also, let people know within your bio, what you do and how you can help them achieve a specific goal they want to reach. Lastly but of great importance, make sure you make use of the section where you can add a website link for your audience to further connect with you outside of Instagram. It’s a great idea for this link to be to a site where you are giving away something of value to your target audience, such as, a free eBook, cheat-sheet, audio or video. This will encourage your followers to give you their name and email address in exchange for your free give away, thereby, giving you the opportunity to further build a relationship with them via email and other methods you might employ. It is important that you use hashtags on your Instagram posts as Hashtags help users find your content by grouping them with other photos that have the same hashtag. This gives your Instagram posts more visibility and targeted views from people who want to see your content. You can also look at Hashtags being used by leaders and people you follow in your industry. You should also make use of trending hashtags with your Instagram posts. Trending hashtags are hashtags based on what is happening at the moment for example, #ThrowBackThursday on a Thursday, #FathersDay #MothersDay. You can make use of trending hashtags by posting content (Photos) that are relevant to the Hashtag which then exposes your content to a much larger and engaged audience. Search and look out for Instagrammers who fit into the profile of your target audience, like their posts and leave genuine comments as well, not just generic comments, such as “nice” or “great photo”. A practical way to do this to get results, is to pick an account from your target audience daily, like at least 5 of their posts and comment on 3. This will make your target audience notice you, come back to your account to find out more about you and most probably give you a follow if they like the content you are sharing. Also, be sure to follow some members of your target audience and others in your niche, remember, Social media is a 2-way street! To find members of your target audience, find out what hashtags they would normally add to their posts using tools like Hashtags.org and Hashtagify.me (or simply look at the hashtags being used by some of the people you know are your target audience already) then search for them using these hashtags. Another way to find your target audience on Instagram is to view your competitors’ followers. Always use Calls-to-actions, Ask! Ask! It’s a good habit to tell your audience and followers what you want them to do. Ask them to follow you for more great content (if they are not doing so already), ask them to like and comment on a post or even expose your post to their friends by tagging them in a comment on your post. Lastly, don’t ignore those who are already following you. Like their comments on your post, reply and say thank you or even visit their own accounts and show interest in what they do by liking and commenting on their own posts! There is a reason why your audience are following you, so make sure you deliver on it. Look at your most-liked and engaged-with posts to find out what your audience like and give them more of those! If you are just starting out, some ideas of what to share with your audience include: Inspirational quotes, tips from your area of expertise, behind-the-scenes pictures of your business and humour are some of the sure things audience usually like to see. Also, make use of a variety of content formats such as pictures, pre-recorded videos, Instagram stories and newly introduced, Instagram live video to appeal to various members of your target audience. Search for users who have an audience similar in size or larger than yours and their target audience is similar to yours, that is, their followers should be people who would be interested in your content as well. Once you find these Instagrammers, start to build an authentic relationship by liking, commenting on and sharing their posts. You can then take the relationship further by approaching them to be a guest contributor on their account or get some of your posts featured on their account and vice-versa if they agree. You can always contact these users via direct messaging on Instagram, email or any other contact information they might have made available on their account. 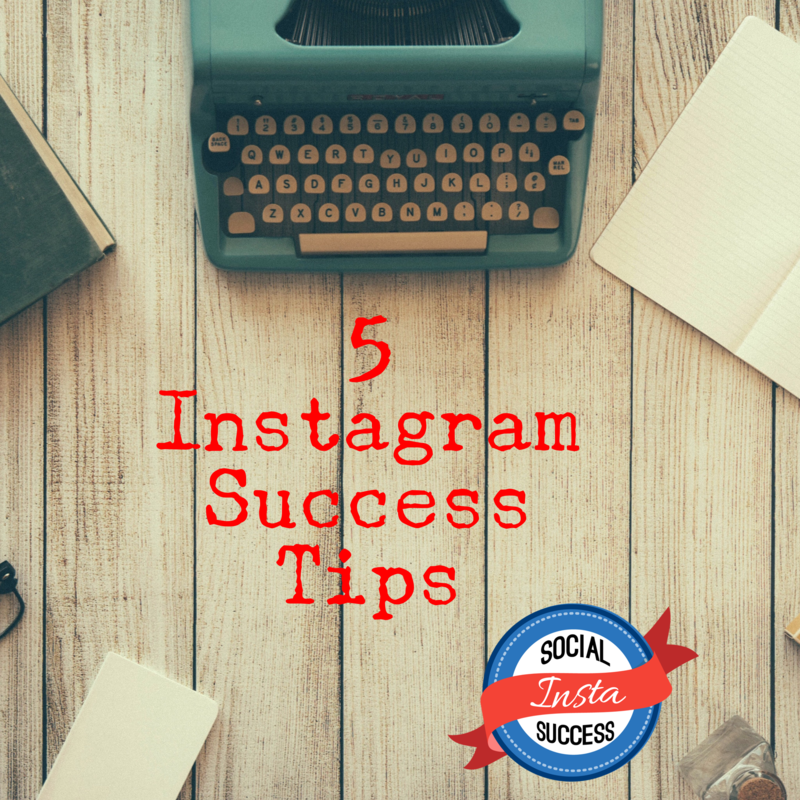 Which of these 5 Tips will you be using to create Instagram Success for your Business in this New Year? To get my full Instagram guide on how to build your brand and business with Instagram, click here if you are in the UK or here if in the United States or rest of the world.